Police armed with machine guns raided a Kurdish tent at the Occupy protest outside St Paul’s Cathedral tonight, Thursday. Kurdish Community Workers duly stamped and labelled for Turkish Secret Services by UK! "As Xezal's nightmare unfolded she was taken, handcuffed, from the plane straight onto the tarmac where a police car was waiting and driven away. She described how she was petrified as these armed men had taken her and she did not even really know who they were!" 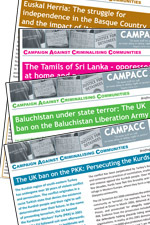 The UK Terrorism Act 2000 is the basis for banning the Kurdish organisations as ‘terrorist’. In 2006 Britain banned Kongra-Gel (People’s Congress of Kurdistan) as an organisation that ‘glorifies terrorism’.